This lace shawl is the perfect knitting project for those who want something small to carry but it still provides a big sense of accomplishment when the piece is finished. Designed by Hazel Carter especially for Blackberry Ridge yarns, this kit is written with plenty of details and charted for easy reading. The instructions begin with "Dedicated to Antoninus Superbus Imperator: the cat who owns me" and proceeds to describe a day in the life of cats on the Shetland Islands through traditional lace stitches. 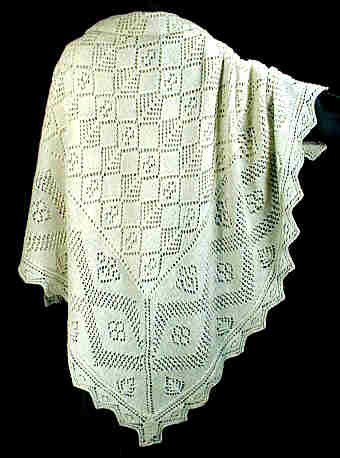 The shawl has a finished size approximately 54 inches square. The kit contains Blackberry Ridge 25% silk / 75% wool lace weight yarn in Natural Cream.